* The Roman Rite is used in the West; the Antiochian and Alexandrian Rites are used in the East. * Unleavened bread is used in the Western Eucharist; leaven bread is used in the East. * The West begins a process toward an all-celibate clergy, based upon the growing East-West trend of electing only celibate monks as bishops. * The East begins to view the Roman Emperor as the supreme Church authority; even over the primacy (in however one defines it) of the Bishop of Rome. This is somehow related to the influence of the Arians at the imperial court; and most likely developed as a modified form of the old, pagan Emperor worship. At the height of the Arian struggle, the Council of Sardica acknowledges the supreme ecclesiastical authority of Rome, and gives the Roman bishop the right to judge cases involving episcopal sees. The presiding bishop at this council is St. Athanasius himself, who had previously been restored to his see of Alexandria by the authority of Pope Julius I --an authority that is even recognized by the Arians, then in power at Constantinople. Thus, Sardica merely codified Rome’s Traditional primacy as a matter of imperial law. The pious, young Western Emperor Gratian relinquishes the pagan imperial title of Pontifex Maximus (head of the Roman state religion) --a title retained by Emperor Constantine I and his four immediate “Christian” successors. Emperor Gratian bestows the Pontifex Maximus title on Pope Damasus of Rome, making it clear that Christianity is now the official “state cult” of the Empire. With the Arians defeated, the Council of Constantinople proclaims the Bishop of Constantinople (the imperial bishop) second in status to the Bishop of Rome --a decision which Rome refuses to endorse, calling it unTraditional. Rather, citing Canon 6 of Nicaea, Rome upholds the authority of Alexandria as the Traditional second see, and that of Antioch as the third see. It claims that this order of primacy was established by St. Peter himself. Thus, Constantinople is denied the status of a Christian patriarchate. With the Council’s decree rejected, Eastern Emperor Theodosius I tries to imitate the policy of Western Emperor Gratian by making St. Gregory of Nazianzus, Bishop of Constantinople, the Pontifex Maximus of the Eastern Empire. St. Gregory, however, refuses to accept the title, and soon after resigns the bishopric. The Western Church uses the Athanasian Creed as well as the Nicene and Apostles’ Creeds. The East uses only the Nicene and Apostles’ Creeds. Around this time, the imperial court of Constantinople moves to make Jerusalem an honorary patriarchate, a status denied to Jerusalem (aka Aelia) by the Council of Nicaea in 325. Although not one of the three original patriarchates established by St. Peter (i.e., Rome, Alexandria, and Antioch), the universal Church gives its approval to the imperial decree so as to venerate the Holy City where Christ died and rose again. The Council of Ephesus deposes Bishop Nestorius of Constantinople for his heretical teaching that Mary was only the mother of Christ’s human nature, but not of His Divine Personhood. Nestorius’ followers break off from the Church and form communities in the Persian Empire known as the Chaldean church --a Nestorian communion, which later spreads into India, forming the Malabar church as well. The Monophysites, who claim that Christ only had one nature --that of God (as opposed to two natures: God and man) are powerful in the Eastern Church. Gaining the Emperor’s support, the Monophysites triumph over the so-called “Robber Council of Ephesus,” and Monophysism is declared to be orthodox doctrine. Numerous orthodox Eastern bishops are deposed, including Bishop Flavian of Constantinople, and appeal to the Pope of Rome to be restored to their sees. Pope Leo the Great urges the new Emperor, Marcianus, to call the Council of Chalcedon to condemn the decisions of the Robber Council. The Pope’s teaching, called the Tome of Leo, is read at the Council, which proclaimed: “This is the Faith of our fathers! Peter has spoken in the person of Leo.” However, Patriarch Dioscorus of Alexandria refuses to accept the Council’s decision and withdraws, taking the entire Egyptian and Ethiopian delegation with him. Because of this, numerous Monophysite communities in the Middle East break off to form independent bodies. Among them are the Coptic (Egyptian) church, the Abyssinian (Ethiopian) church, the Jacobite (Syrian) church, the Armenian church, and the Syro-Malankar (Indian) church. With the see of Alexandria plunged into heresy, the Byzantines at the Council of Chalcedon make another attempt to declare the Bishop of Constantinople second in status after the Pope of Rome. However, this innovation, known as Canon 28, is unilaterally rejected by Pope Leo, and struck from the canons of the Council (in both East and West) by Papal decree. Bishop Anatolius of Constantinople writes to Pope Leo to apologize for the attempted innovation. Thus, Constantinople is again denied the status of a patriarchate, and Rome displays its final authority, even over the decrees of Ecumenical Councils. Pope Leo releases an Edit declaring the Bishop of Rome’s authority over the universal Church. FIRST SCHISM: Acacius, Bishop of Constantinople, persuades Eastern Emperor Zeno to issue the Henoticon (“Act of Union”) to appease the Monophysites --a doctrinal compromise and a contradiction of Chalcedon, which all the Eastern bishops sign. Pope Felix III (II) excommunicates both Acacius as well as the Patriarchs of Alexandria and Antioch --in essence, excommunicating the entire East! Greek begins to replace Latin as the official tongue of the Eastern Empire. Eastern Emperor Justin I, an orthodox Christian, tries to heal the schism, sending a party of Eastern bishops to Rome to confer with Pope Hormisdas. All of these Eastern bishops (including the patriarchs of Alexandria, Antioch, Jerusalem, and the Bishop of Constantinople) sign the “Libellus Hormisdae,” which clearly defines the primacy of the Roman See based on the Pope’s succession from St. Peter. About this time, the imperial court of Constantinople begins a policy of placing Byzantine Greek bishops on the episcopal thrones of Alexandria, Antioch, and Jerusalem to guard against the heresy of Monophysism. The native Christians of Egypt, Syria, and Palestine (most of whom are Monophysites) resent this “imperial intrusion,” and call these foreign bishops “Melchites” (a Syrian term, meaning “of the king ”). The Monophysites then appoint their own bishops in Alexandria, Antioch, and Jerusalem; and the East is plagued by all manner of disputes and schisms. The Council of Toledo in Spain adds the “Filioque clause” to the Nicene Creed, but later withdraws it (at the Pope’s request) to appease the East. The West, as well as the Cappadocian fathers of Asia Minor (i.e., St. Basil, St. Gregory of Nyssa, and St. Gregory Nazianzus), have accepted the clause’s theology since the mid-300’s. The Western Church continues the process toward an all-celibate clergy. The Greek Church gives an even greater role to the Emperor, calling him the “Christ on Earth” (evidently to compete w/ Islam’s Caliph, “The Defender of the Faith”). The Eastern Church/government begins to pattern itself after the Hughic Kingdom of Israel, with the Emperor possessing an essential Church office. About this time, the Byzantine Emperor tries to secure the title of “Ecumenical Patriarch” for the Bishop of Constantinople. This would give the Bishop of Constantinople the power and authority to call ecumenical councils; however the Emperor’s request is solemnly denied by Pope Gregory the Great, who calls the title haughty, proud, and unTraditional. Gregory still defends the three-patriarchal system of Rome, Alexandria, and Antioch as it was established by St. Peter. Also about this time, the Monophysite Christians in Egypt, Palestine, and Syria begin to form alliances with the rising power of Islam against their Byzantine (“Melchite”) rivals. The Arab Muslims promise the Monophysite Christians freedom of worship; and, with Monophysite help, the Muslims are able to capture Egypt, Palestine, and part of Syria from the Byzantine Empire. While living in Rome, St. Maximos the Confessor (a native of Constantinople) defends the orthodoxy of the Filioque clause and writes to his Byzantine peers, explaining what the Romans really mean by it. SECOND SCHISM: In a desperate attempt to re-unify his Christian Empire and bring the dissident Christians of Egypt, Palestine, and Syria back into the fold, Emperor Constans II tries to impose the doctrine of Monothelitism (“Christ had only One Will”) on the Empire as a compromise with Monophysism. The heresy is rejected by the West, but temporarily embraced by the Maronite church in Syria and Lebanon. After condemning the heresy of Monothelitism at a synod held in Rome, Pope Martin I is arrested by Byzantine troops and taken to Constantinople, where he is publicly abused by the mob and then exiled to Crimea, dying as a martyr for orthodoxy. SECOND SCHISM HEALED when the Council of Constantinople III condemns Monothelitism, reuniting the Church. --The legal code of the Quinisext (or Trullian) Council of Constantinople (which, among other secular innovations, dispensed with the Apostolic discipline of sexual continence for married priests) is rejected by the West, but eventually accepted by Pope John VII, who needed Byzantine support against the Lombard invaders of Italy. Around this time, Rome recognizes Constantinople as a patriarchate. With the two great Eastern sees of Alexandria and Antioch reduced to minor Christian communities by the Muslims, Constantinople remains the only Christian capital in the East. THIRD SCHISM: Pope Gregory III excommunicates the Iconoclasts, infuriating Emperor Leo III, who --evidently influenced by Islamic sensibilities --promoted the heresy. THIRD SCHISM HEALED by the Council of Nicaea II, which condemns the Iconoclasts and restores the use of images in Church worship. Pope Leo III crowns Charlemagne Emperor of the West (i.e., Holy Roman Emperor). This act marks the end of Papal dependence on the Eastern Emperor, but the Pope still refuses Charlemagne’s pressure to include the “Filioque clause” in the Nicene Creed, so as not to alienate the East. The East takes offense at the Pope’s crowning of a “barbarian” as Emperor. Boris I, the Bulgarian Khan, withdraws his acceptance of the primacy of Rome when Pope Adrian II refuses to make Bulgaria a patriarchate. Bulgaria shifts its allegiance to Constantinople -- a Byzantine political coup, since Constantinople needed to “control” the Bulgarians to protect their northern frontier. The Byzantine court sends Sts. Cyril and Methodius into the Balkans to convert the pagan Slavs. Though originally part of the Eastern Empire, this region falls into the Pope of Rome’s Western patriarchate; and Roman Rite missionaries from Germany conflict with the Byzantines, who are adapting the Liturgy into Slavonic, and thus achieving more conversions. To get to the bottom of this conflict, the Pope calls Cyril and Methodius to Rome; and Rome gives its blessing to their ministry. Cyril and Methodius also recognize the universal primacy of the Pope of Rome. Thus, the Slavic Balkan kingdoms embrace the Byzantine Rite as opposed to the Roman Rite --another coup for the court of Constantinople which, as with Bulgaria, needed to establish religious /cultural ties with the Slavs so as to safeguard the Empire’s northern frontier. FOURTH SCHISM HEALED when Emperor Basil I calls the 6th Council of Constantinople to depose Photius. After being reinstated to the See of Constantinople with Rome’s blessing in 878, Photius conflicts with Pope Stephen V over Papal prerogatives, and is deposed by Emperor Leo VI. Photius dies in communion with Rome. Pope John X tries to bring the Bulgarians back into communion with Rome. Prince Vladimir I of Russia embraces the Byzantine form of Christianity, making it the official religion of the Russian people. He also marries a Byzantine princess. The West unilaterally adopts the “Filioque clause” into the Nicene Creed. Michael Cerularius, Patriarch of Constantinople, launches an anti-Latin campaign. He closes all the Latin churches in Constantinople and attacks the “Filioque clause” and Papal authority, claiming that the Pope has no authority to adapt the Creed. His army enters latin Churches in Constantinople and throws Eucharists into the street. THE FIFTH (GREAT) SCHISM: Differences come to a head as Cardinal Humbertus, Papal legate of Leo IX excommunicates Patriarch Michael Cerularius and all his communicates (something he does without Papal approval, since Pope Leo had died shortly before). The Patriarch, in turn, excommunicates Humbertus and his fellow Papal delegates. Crushing Byzantine defeat at Manzinkert, Armenia. The Byzantine army is completely destroyed, and the Muslim Turks take Asia Minor and the entire Middle East. Pressed by the Turks, the Byzantine Emperor turns to the Pope for western aid. He actually just wants mercenary troops, but Pope Urban II launches the First Crusade as an attempt to heal the Schism. Urban also lifts the ban of excommunication on Emperor Alexius I Comnenus. The Maronite church of Syria and Lebanon abandons what’s left of its sympathies for Monothelitism and reestablishes full communion with Rome. At the order of Emperor Manuel, thousands of Italian merchants (and other Westerners) living in the Byzantine Empire are killed, mutilated, or arrested and held for years in prison. Crusader atrocities against Byzantine Christians in Cyprus. Byzantine Emperor Isaac II Angelus writes a letter to the Muslim Sultan Saladin congratulating him for successfully recapturing Jerusalem from the Western crusaders. Emperor Isaac betrays the German army of the Third Crusade. After promising Holy Roman Emperor Frederick Barbarossa safe passage for his troops through Byzantine dominions on the way to the Holy Land, Isaac uses Turkish mercenaries to ambush and destroy the German army. Informed of his Eastern colleague's treachery, Emperor Frederick sends word to his son Henry in Germany to seek Papal approval for action against the Byzantines. The Pope refuses to give his consent. In the same year (1188) Patriarch Dositheus of Constantinople offers unconditional absolution to any Greek killing a Westerner. The armies of the Fourth Crusade are persuaded by the Venetians to violently sack Constantinople (their commercial rival). This act of savagery perpetuates hostilities between East and West. At first, the Pope excommunicates the crusaders; but later gives his blessing to the Latin Empire of Constantinople. Roman Catholic missionaries take advantage of the newly-open trade routes of the Mongol Empire, and begin to evangelize central Asia and China. Many Nestorian Christians in these regions re-enter into communion with Rome. FIFTH SCHISM TEMPORARILY HEALED at the Council of Lyons II, called by Pope Gregory X. Soon after, in 1276, Emperor Michael VIII Palaeologos and Pope John XXI affect a reunion of East and West. The East accepts the orthodoxy of Filioque, Unleavened Bread in the Eucharist, and the Western understanding of Purgatory. SIXTH SCHISM: Temporary reunion is destroyed when Pope Martin IV excommunicates Emperor Michael VIII Palaeologos. Emperor John V Palaeologus offers to submit to Papal authority in exchange for Western aid against the encroaching Turks. SIXTH SCHISM HEALED as Emperor John VIII Palaeologos travels to Italy with all four Eastern Patriarchs and submits to Pope Eugene VI. The Act of Union is drafted by the Council of Ferrara-Florence. The East accepts the “Filioque clause” in the form: “From the Father through the Son,” as well as the other Western doctrines approved at Lyons II. Other Eastern churches, such as the Armenians, Jacobites, and some Nestorian bodies re-enter into communion with Rome. This is the beginning of the Eastern Catholic Uniates, which also include Copts, Ethiopians, Maronites, Melchites, Syrians, and Syro-Malankars. The decisions reached at Ferrara-Florence are bitterly opposed by most of the Byzantine populace and clergy. Partly due to this, the crusade launched by Pope Eugene VI to relieve Constantinople from the surrounding Turks is a dismal failure. Constantinople falls to the Turks. But, as a touching gesture in the city’s last moments, both Byzantine and Roman Christians receive Holy Communion together in the Church of Hagia Sophia, before facing slavery or death. The Trebizond Empire (last pocket of the Byzantine Empire) falls to the Turks. The Turks want no contact between Byzantines and the West. They exploit the doctrinal differences, persecuting Western Christians; and naming the Patriarch of Constantinople as head of the Christian community within the Turkish domain (i.e., the bishop of Byzantium finally gets the title of “Ecumenical Patriarch” --from Muslims). The Greek Orthodox scholar and Roman Catholic Cardinal, Johannes Bessarion, is made Latin Patriarch of Constantinople by Pope Pius II. A crusade organized by Pope Pius II to rescue Constantinople falls apart before leaving Italy, and Pius dies en route. SEVENTH SCHISM: The Greek bishops nullify the Ferrara-Florence Act of Union at a synod in Constantinople. Coincidentally (? ), in the same year, Grand Duke Ivan III of Moscow marries Zoe Sophia, the niece of the last Byzantine Emperor. Moscow is now considered the “third Rome,” the successor to Constantinople, and the center of Eastern Orthodox Christianity. The prince of Moscow takes the title of Czar (“Caesar”). Protestant churches of the Reformation break off from Rome. The Church of England is established as a supposedly autonomous “Catholic” body. Also in the 1500’s, Spanish and Portuguese missionaries bring many of the Malabar (Nestorian) and Syro-Malankar (Monophysite) Christians of India back into communion with Rome. Pope Gregory XIII introduces the new, Gregorian calendar; whereas the East still uses the old Julian calendar. Consequently, East and West celebrate Easter on different dates. The Union of Brest is formed, as a party of Ukrainian bishops appeals to Rome to be readmitted into communion with the Western Church, while being allowed to retain their specific Eastern Liturgy, theology and discipline. The adoption of the Athanasian Creed is somehow related to the liturgical reforms conducted under Patriarch Nikon of Moscow (1605-81) after Russia recaptured the Ukraine from Poland in 1667. Formerly a metropolitan district under Constantinople, certain conditions had to be met before the Ukraine could accept the leadership of the Moscow Patriarch. To this end, Nikon introduced reforms into the Russian ritual adhering more closely to the original Byzantine Liturgy which, he discovered, had been distorted in the Slavonic translation from Greek. His reforms, however, caused a schism, with most of the Russian clergy refusing to abandon rituals which were followed for centuries. But, at a Russian synod in 1667, the dissenters were declared schismatics. The Union of Uzhorod is formed, in which another group of Eastern Orthodox clergy and laymen (this time from the Transcarpathian region of what is now Slovakia, Ukraine, and Hungary) also request acceptance into communion with Rome. After a dispute over patriarchal succession in the Antiochian Orthodox Church, a party of Melchites in Syria seeks to re-enter into communion with Rome. Rome recognizes the Melchite Catholic Patriarch in Damascus. The Greek Orthodox Church adopts the Athanasian Creed, but drops it soon afterward. The Roman Catholic Church defines both Papal Infallibility and Mary’s Immaculate Conception to be dogmas of the universal Church. Numerous Byzantine-Rite communities in Eastern Europe and the Ukraine enter into communion with Rome, forming the greater part of the Byzantine Catholic Church. The Pope defines Mary’s Assumption (aka Dormition) as a dogma. 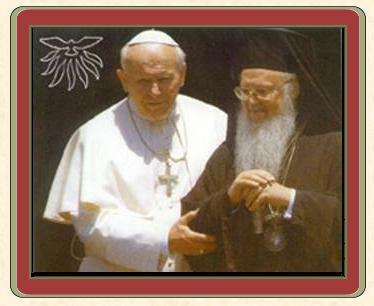 Pope Paul VI and Patriarch Athenagorus of Constantinople meet and nullify the mutual excommunications. Although better relations are established, the East-West Schism continues. John Paul II affects a reunion with the Nestorian Patriarch, welcoming the Nestorians of Syria and Iraq back into communion with Rome after their acceptance of the “Theotokos” dogma. The Nestorian schism of 431 is largely healed; and the Apostolic Christians of Iraq are now called Chaldean Catholics. A significant number of Anglican communities re-enter into communion with Rome. "... we cannot fail to recognize the infidelities to the Gospel committed by some of our brethren, especially during the second millennium. Let us ask pardon for the divisions which have occurred among Christians, for the violence some have used in the service of the truth and for the distrustful and hostile attitudes sometimes taken towards the followers of other religions." "Clearly there is a need for a liberating process of purification of memory. For the occasions past and present, when sons and daughters of the Catholic Church have sinned by action or omission against their Orthodox brothers and sisters, may the Lord grant us the forgiveness we beg of Him." "Some memories are especially painful, and some events of the distant past have left deep wounds in the minds and hearts of people to this day. I am thinking of the disastrous sack of the imperial city of Constantinople, which was for so long the bastion of Christianity in the East. It is tragic that the assailants, who had set out to secure free access for Christians to the Holy Land, turned against their own brothers in the faith. The fact that they were Latin Christians [Roman Catholics] fills Catholics with deep regret. How can we fail to see here the 'mysterium iniquitatis' at work in the human heart? To God alone belongs judgment and, therefore, we entrust the heavy burden of the past to his endless mercy, imploring him to heal the wounds that still cause suffering to the spirit of the Greek people."